The above link seems broken, what is meant by urbanforest? The link to the project, which I had mentioned in the comment above seems to be outdated again. Established in 1995, Worldstudio is a strategy and communications firm that works in two ways; through the Social initiatives it develops and the Client services it provides. For the patient reader here a quick link to the game The wisdom and/or madness of crowds in which you can -amongst others – chop graphs. 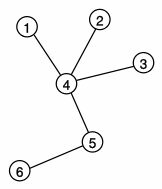 As mathematical trees are special types of graphs (in particular they don’t have cycles) that means – depending on what you do – there may even be some trees to be chopped in that game (german version via Stefan Münz).